The Galway Cycling Campaign is objecting to a proposed new greenway some 150 miles away in Kerry because it fears it will pit farmers against cyclists nationally. The campaign group says Kerry County Council had promised local farmers in Kerry that no compulsory purchase orders (CPOs) would be used to acquire parcels of their land to make the greenway possible. But the Galway Cycling Campaign says that promise has now fallen by the wayside. And it fears this issue may trigger resistance to future greenways elsewhere in Ireland from the farming community. 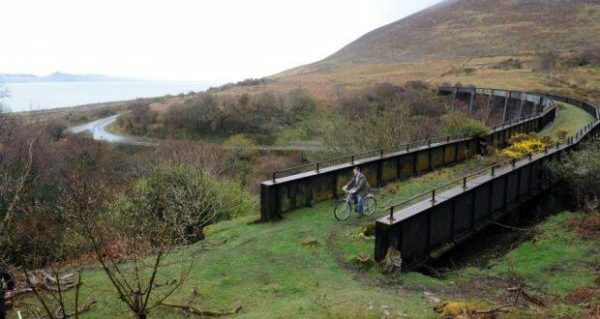 It also has a number of other concerns about the mooted south Kerry greenway, but the possible rift between farming and cycling groups is its chief concern. A spokesman for the Galway group, Oisin O Nidh, said any bad feeling between farming groups and those wishing to build future greenways could be very damaging far beyond the Kerry region. “If conducted badly, the south Kerry project could set farmers around the country in general in opposition to greenway projects,” he said. The Irish Farmers’ Association (IFA) has also lodged an objection. It is believed to be the first time it has ever done so in relation to a greenway. It has said farmers’ concerns had not been listened to in the area. Furthermore, the IFA pointed out that alternative routes had been proposed in places by farmers but these had not been seriously considered. IFA county chairman Pat O’Driscoll said while CPOs had initially been ruled out, the local council now wanted to rely heavily on them. He said national guidelines for greenways stated local authorities should design them in such a way that avoids severance of land holdings. And the IFA felt the plans in Kerry did not adhere to those guidelines. The local authority, he said, had misled farmers and failed to acknowledge their alternatives or to fully liaise with them. While planning permission for the project is not due to be decided until next March, debate around the mooted greenway has whipped up of late. The route would take in 32km; most of it on a disused rail line that would be perfect for cycling. It starts at Renard Point near Cahirciveen, which is where the Valentia Island ferry departs. The greenway would then continue to Glenbeigh, following the former Great Southern & Western railway that closed in 1960. Unlike their colleagues in Galway, the Kerry Cycling Campaign is backing the proposed new south Kerry greenway. Like many supporters locally, it believes it would be a stunning facility and would also boost the local economy. It has some concerns, saying while the greenway is planned to be three metres wide, it should be wider in some places. And it also believes chicanes that would force cyclists to dismount in some places are unsuitable and run contrary to design guidelines. Aside from those concerns, the Kerry Cycling Campaign is still firmly behind the project overall.